We are back in Taiohae on Nuku Hiva for the second time (you haven’t heard about the first time yet.) Since our blog posts have been lagging behind real time, I decided to do an update with our current status. I could be posting “from the road” via HAM radio as we move through the Marquesas, like I do at sea, but the things we’re seeing are so incredible, there seems to be no point in publishing the posts without the photos right now. 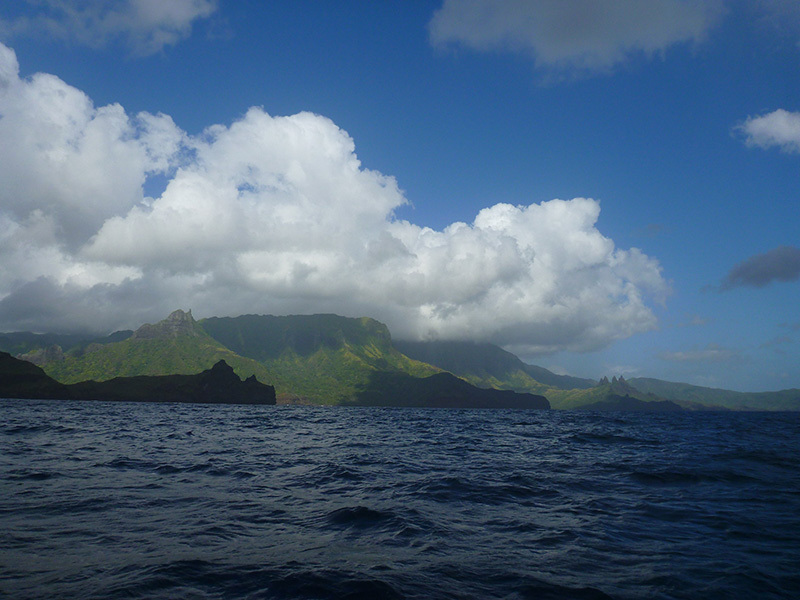 We just finished a circumnavigation of the island of Nuku Hiva, stopping in various anchorages along the way. 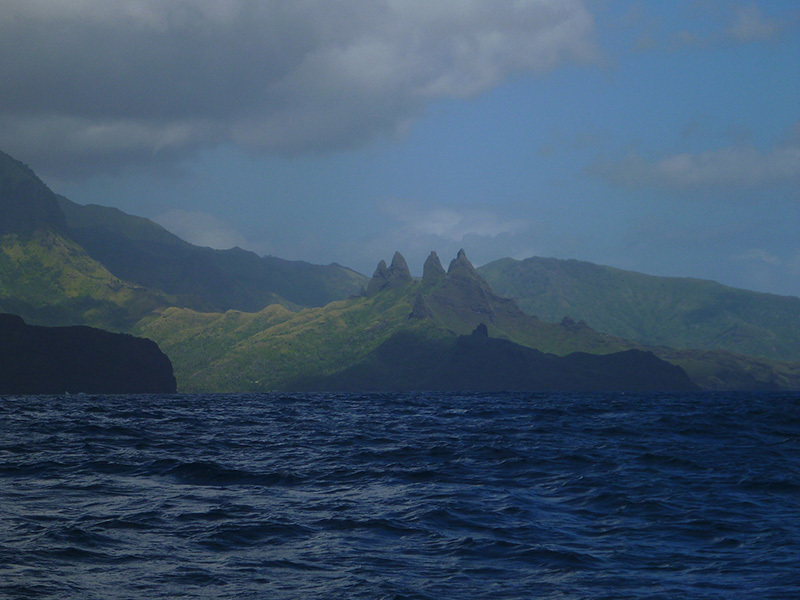 This is the first of the Marquesas we have circumnavigated. 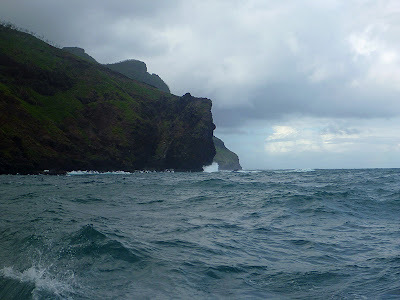 We sailed about three-quarters of the way around Hiva Oa, but there was a long stretch of the north side between Hanamenu and Puamau that we didn’t see. We didn’t even come close to circumnavigating any of the other islands. The most significant aspect of our trip---in addition to all the wonderful places we visited---was the weather. We experienced the worst weather since we arrived in the Marquesas traveling around the island of Nuku Hiva. Every time we changed anchorages, we went out into a huge swell, and almost every transit involved some bashing to weather in 20-knot plus winds. 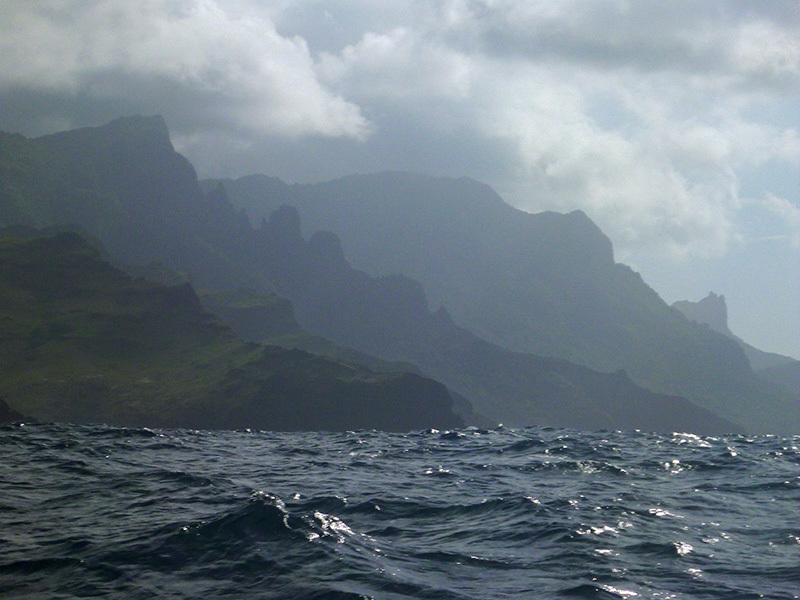 Tacking back and forth to round the southeastern tip of the island was exciting, though time-consuming sailing. Luckily for us, our first trip on Silhouette was almost entirely to weather, so we have learned how to secure the boat pretty well under these conditions. 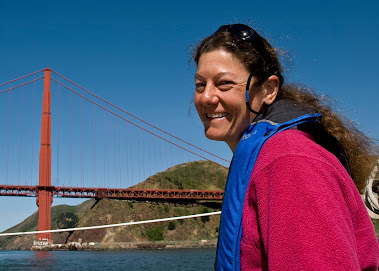 Small improvements to our living space along the way---such as towel loops on bath towels and a tether on our dish drainer---have helped eliminate the chaotic feel of those early days, when everything seemed to be in disarray while the boat was crashing about. We had to delay our entrance into the harbor in order to allow a squall---with a peak gust of 36 knots---to pass over us. We hadn’t had the foresight to dig out the ski goggles, and the rain and spray were literally blinding. 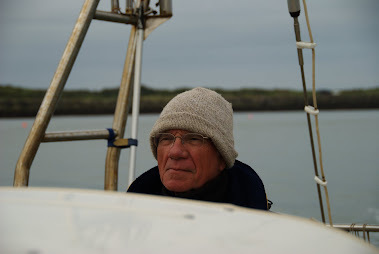 Shielded by the dodger, I was reading the compass bearings to Patrick, who was steering in order to keep us pointed offshore (the sentinels---islands along either side of the anchorage entrance--- along with all other signs of land had completely disappeared in the clouds and rain.) The sea---whose ten foot swells we had been heading into moments before---was beaten down by the rain into a soft texture we’ve only seen in squalls. Luckily, squalls move quickly and don’t last for very long. After ten minutes or so of this, the sky cleared, and we rolled our way from gunnel to gunnel into the anchorage among the huge swells. Bahie Taiohae had turned into a gigantic mud puddle since we’d last seen it a week ago. Later while having dinner up at the dock, Henri---a local who enjoys conversing with cruisers---told us he had heard about a tropical depression on the TV. It is supposed to last for the next several days, so we probably won’t be leaving for the Tuamotus until sometime mid next week. 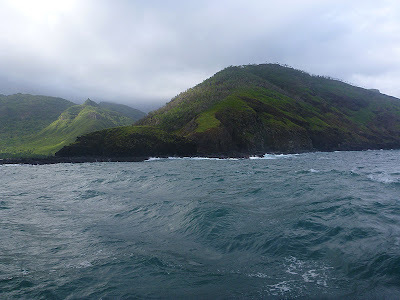 It is definitely time to move on from the Marquesas. If you told me that a week ago, I wouldn’t have felt ready to leave. There were still too many things I hadn’t seen. However, now I feel ready to move on. We have officially been here one month tomorrow, and we can only stay in French Polynesia for ninety days. We still have the Tuamotus and Society Islands to explore. More than that, however, the weather is beginning to remind us of the Pacific Northwest! June through August is the rainy season in the Marquesas. When we first got here in mid-June, the rain wasn’t bad. There was the occasional tropical downpour, but the rain usually passed quickly. Most of the rain showers occurred at night, while it was dry and sunny during the day. Anything that got wet would usually dry out within a couple of hours in the next period of sunshine. In July, we have noticed an increase in the rain. As I write this, I am surrounded by three sets of clothing from yesterday---none of which are completely dry---hanging on an indoor clothesline in the salon. How much of this wet weather is seasonal, and how much is related to the current tropical depression, remains unknown. However, photos of turquoise lagoons published on the blogs of sailboats ahead of us on the “Coconut Milk Run” urge us on: it is time to go someplace where the sun is shining!